These blue cheese and chilli stuffed chicken thighs are the ultimate weekend lunch dish. 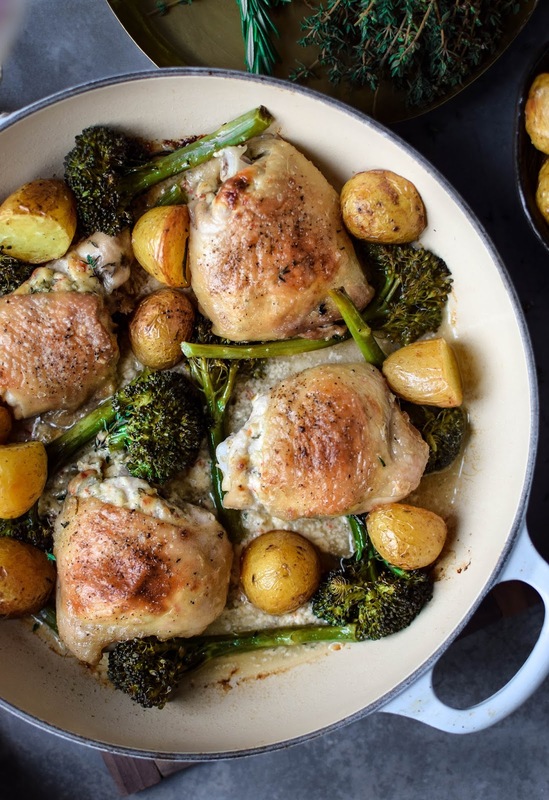 This one pan recipe is super simple to throw together without scrimping on taste. Serve with some roasted new potatoes for a decadent treat. Aren’t one pan meals the best! You just throw everything in a pan, shove it in the oven and hey presto, you’ve got yourself a meal. OK, I’m over simplifying here, this recipe does involve a little bit of hands on action but it’s so quick you’d hardly even notice you’re doing it. Just pop on some music and enjoy stuffing those thighs. Singing at the top of your lungs is a bonus for you, and your neighbours. I love to serve this dish with roasted new potatoes but it would be equally delicious alongside a crisp green salad. Just make sure you save those cooking juices for drizzling, that’s some good flavour right there. Preheat the oven to 180°C fan. In a large bowl mash the mascarpone, blue cheese, chilli, garlic and thyme together with a fork. Season and set aside. Using your fingers, very gently separate the chicken skin from the meat then fill these little pockets with a heaping tablespoon of the cheesy stuffing. Press it into all the nooks and crannies before filling the remaining thighs. Place the stuffed thighs into a small baking dish, skin side up and pour in the wine. Drizzle the thighs with the olive oil and give them a little rub. 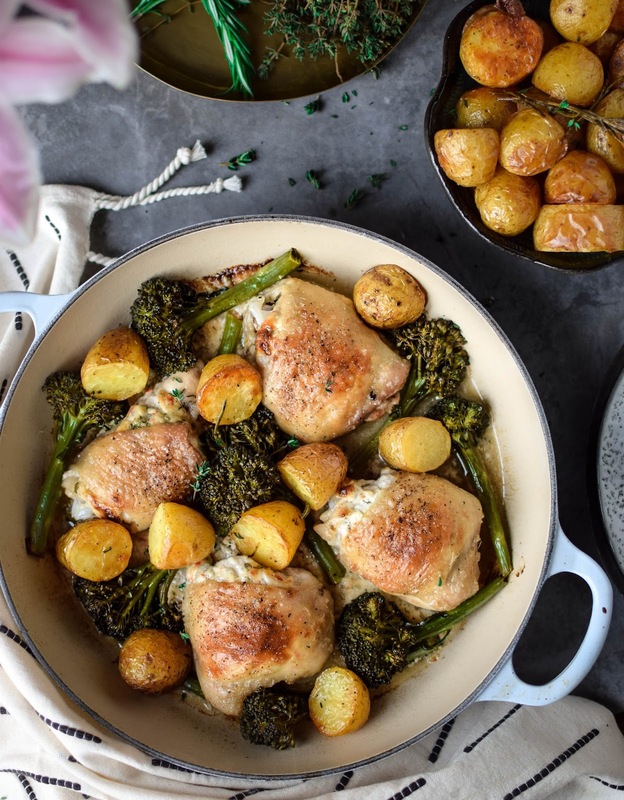 Season the top of the chicken and roast for 30 minutes then place the tenderstem broccoli around the thighs before roasting for a further 20 minutes until the skins are crispy and the chicken is cooked through. Serve with roasted new potatoes or a crisp, green salad and drizzled with the cooking juices. This dish sounds and looks delicious. I'm not a fan of blue cheese but that could easily be substituted for another cheese. And I love one-pot dishes! This looks delicious! I'm not usually a blue cheese fan but I want to try this. This looks so flavoursome, definitely Pinning for later! This looks so delicious! 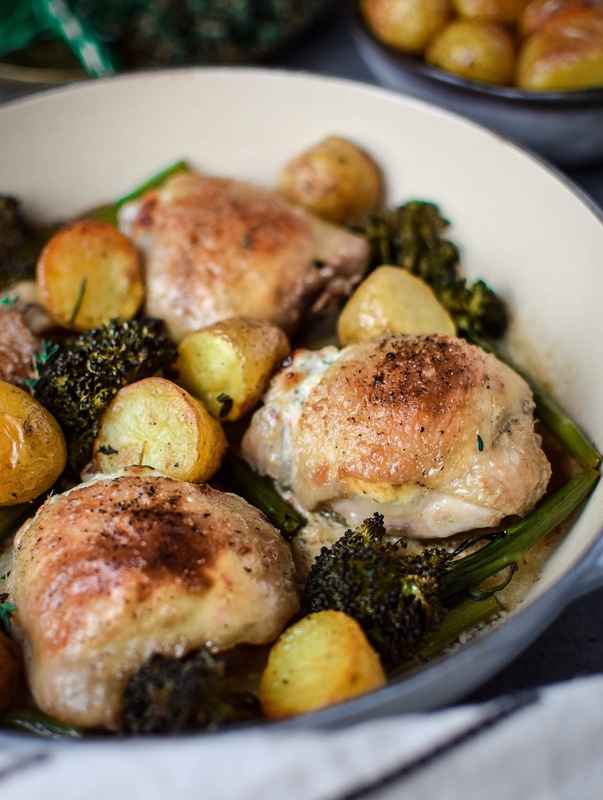 Chicken is so versatile to cook with and this is a great recipe idea! Oh YUM! 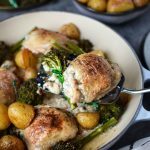 I love the idea of using blue cheese in this dish, I would never think of it with chicken! I am so going to try them! I agree: one-pan meals are the BEST. 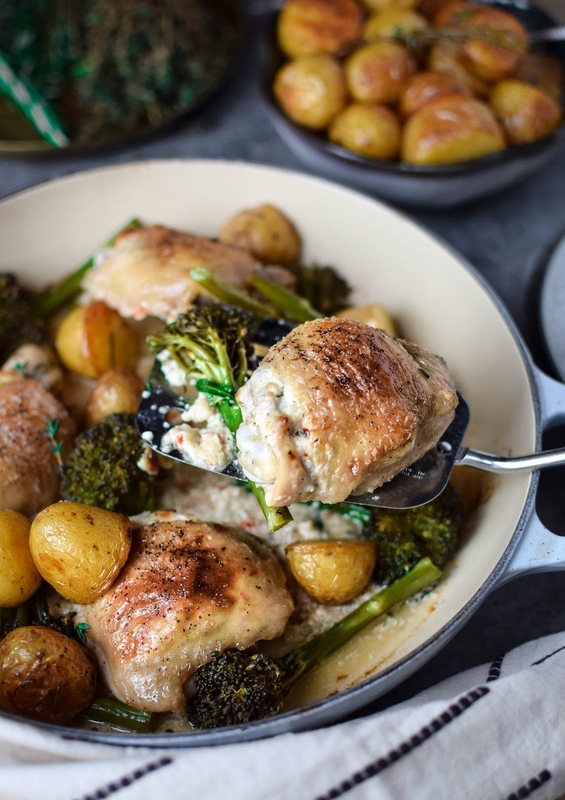 I love that you use chicken thighs here: so much better than breasts, in my opinion! This filling sounds to-die-for! I’m a vegetarian and have been my whole life, but I must admit that this looks yummy. I’m sure my partner would inhale it! This looks so good and healthy! Thanks for sharing! This looks incredible! I'm not a fan of cheese, but anything with chilli on it is a winner in my eyes. This recipe sounds delicious, and so easy to make. Always great when you can throw it all in the one pan. I have to admit when i first read the title of the recipe I was kind of unsure as to what to think lol but having seen it it looks incredible.